"Trials or Tragedies are inevitable as long as we are alive on earth. How we face them and go through them is what makes the difference between living in fear and anger or living in peace and joy. In “Refuge”, I want to depict the truths that we all need to know and believe if we are to find the inner peace we all long for. These truths are: we are "never alone," and we are accompanied by One who gives us the ability to face anything that comes our way. When we do face these times in our lives He helps us make it through them "intact" – they are not unto our destruction In this painting, I've portrayed these truths in the stained glass window depicting the three Hebrews from the Bible in Daniel, who were protected in Nebuchadnezzer's fiery furnace by the angel of the Lord to the amazement of many witnesses. 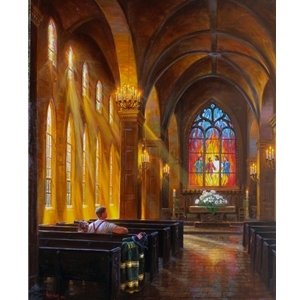 The fireman in the painting, is, also, a symbol of someone who is protected from modern day flames and is pondering in a moment of reflection, the Truth of the biblical account. As the fireman gathers courage from the ancient story and from the reality of the One who says "I will never leave you," he realizes he has chosen go against what seems like "hell" (fiery blazes) to help those in trouble - taking a stand in a way and place that could do him great harm. His willingness to take this stand is worth emulating as we, too, will be faced with our own “too hot to handle” circumstances. It takes more than fireman's gear to face the blazes of life, it takes courage, as well. No matter what you face in life, from past hurts to present circumstances, I hope you find the courage to go through it - in the strength and comfort of the One who longs to be your Refuge."